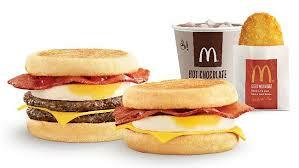 In food news just in, McDonald's will be rolling out ALL DAY breakfast from today. McDonald’s restaurants in Australia will now be serving a new all-day breakfast menu, to be rolled out from today. “Macca’s restaurants across Wollongong and the Illawarra (excluding food court kiosks) will be serving breakfast favourites including the Bacon and Egg and Sausage and Egg McMuffins, Hashbrowns and Hotcakes 24 hours, seven days a week,” McDonald’s said in a press release. There are plans to expand the all-day breakfast menu across the rest of the country soon. And: the Gold Coast will be the next location to get the all day breakfast, from next month. Some McDonald’s restaurants in the US are already trialling the all day brekkie.